Serena Williams will add to her tally of grand slams "sooner or later", according to Monica Seles. Former world number one Williams returned to the WTA Tour in 2018 following a 14-month absence having had her first child. The American great reached the finals of Wimbledon and the US Open but fell short on both occasions to remain on 23 slam titles. 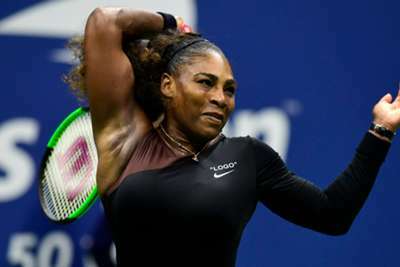 The second of those defeats at Flushing Meadows was overshadowed by a furious row with umpire Carlos Ramos, who docked Williams a game when she labelled him a "liar" and a "thief". But Seles tipped Williams to remain in slam contention over the next couple of seasons and fully expects the 37-year-old to win more of tennis' big four. "Is it going to be 2019, 2020? I think sooner or later, she's going to win her next grand slam and probably a few more I think, as long as her body allows her to do that," she told WTA Media. "I think she definitely has that hunger. In 2018, being so close at Wimbledon and the US Open, but yet so far away, is going to definitely give her that extra incentive and practice to do that. "I'm sure she's navigating new waters with being a mum, professional player, getting married, making history. These things usually don't happen all in one year like it has happened in her life. "So, just as a fan of the sport, fan of hers, it's really an exciting time to watch." Lindsay Davenport paid tribute to Williams' comeback, but is intrigued to see if she can maintain her motivation levels. "I knew it would be a challenge for Serena. I think she admits herself it's been even more difficult than she thought it would be," she said. "As you get older, it gets tougher and when you're a mum trying to balance everything, it's not easy. "I tried it for about a year and it was really overwhelming. She is doing her best, there's no doubt about it. It'll be interesting to see what her motivation is like in 2019, because you're getting pulled in so many different directions. "She's talked openly about wanting to have more kids. She's now 37, she's got a little one. It gets tougher to travel with them at certain ages. "I'm really interested to see how she starts off the season and if she's ready to go."